Sixteen original stories from today's hottest paranormal writers. A journey may take hundreds of miles, or it may cover the distance between duty and desire. Chilling, funny, or romantic, these tales of journeys will leave readers enthralled. So this is an anthology and I can't exactly review it list-format like I do with regular novels. That being said, I'll try my best to give a quick summary of each story and then talk about my favorites and the anthology in general. And I also want to say that though I've now only read four anthologies total, this one is by far my favorite of them all. This post is really long. Don't say I didn't warn you :P.
"Giovanni's Farewell" by Claudia Gray - While in Rome on a school trip, Cairo, Ravenna's brother, claims to be developing psychic powers, something which frightens Ravenna and makes her feel concerned for her brother's mental stability... until she too has a strange experience. "Things about Love" by Jackson Pearce - This story is set in the same world as As You Wish. After Jinn, a genie, fell in love with Viola, a mortal, the whole of Caliban was shocked so Juliet, another genie, comes to Lawrence (Viola's friend) to learn about love and the frightening implications and questions that have arisen for her jinn world. "Niederwald" by Rachel Vincent - Characters from the Soul Screamers series appear here. Sabine, a mara, wants to steal her boyfriend Nash back from Kaylee so she and Kaylee's friend, Emma, stop at Niederwald to visit Syrie, a psychic of sorts whose house is guarded by very dangerous harpies. "A Mortal Winter King" by Melissa Marr - A Wicked Lovely story.... What happens when Keenan, the former Summer King, now a mere mortal, and Donia, the Winter Queen, go on vacation? Find out and listen to their debate on whether or not Keenan should risk taking the Winter Queen's staff to make him a faery again. "Facing Facts" by Kelley Armstrong - I think this is set in the same world as one of her series because I remember the Edison Group being mentioned in the other story of hers that I read in The Eternal Kiss--I'm not sure though because I haven't had a chance to read any of them. Anyways, this story is about Kit telling Tori that he is her father, Tori subsequently running away, and Chloe, a necromancer, chasing after her and dealing with her own haunted feelings about what had happened regarding Tori's mother. "Bridge" by Jeri Smith-Ready - In the same world as the Shade series. A story told in verse about Logan, who is now a ghost and contacts a Post-Shifter so that she can convince his brother Mikey to move on 233 days after Logan's surprising death. "Skin Contact" by Kimberly Derting - In the same world as the Body Finder series. Rafe, a character from Desires of the Dead, has a vision that he fears has come true (though his true power lies comes from skin contact) and sets off to see what happened for himself. "Leaving" by Ally Condie - About Sora, a young girl who has to deal with her grief over her father's leaving and the implications of what that has meant for her (being Untouchable and lonely, wanting to leave though it would also mean leaving Elio, etc.) and what it indicated about her father as a person. "I.V. League" by Margaret Stohl - A pair of Drinkers fake transcripts and the likes and apply to Ivy League colleges. They drive to an interview with an Admissions Breather at Harvard. Will they get accepted? "Gargouille" by Mary E. Pearson - About a gargoyle/gargouille, watcher of the night, who was caught and sold to a duke and had her wings cut off and the consequences of those actions on her life. "The Third Kind" by Jennifer Lynn Barnes - An impulse to go to San Antonio with Jess strikes Kissy, and even when she was young, Kissy could not resist the 'pulse. The real mystery is ... why San Antonio? What's there and what will happen to Kissy and Jess on this trip? "Automatic" by Rachel Caine - What happens when a Coke vending machine in Morganville stocks cans of blood that are doled out via ID card? Read about the consequences for Michael. "Gargouille" by Mary E. Pearson - Oh man. It wasn't just that I hadn't read anything about gargoyles before and that I thought it perhaps was one of the most original of them all--my love of this story comes from so much more. The setting, the romance, the world created, and best of all, the writing. I really, really loved the descriptions of Etienne and Giselle's past together (esp. pages 378-379). Touching and sweet and heartbreaking all at once. If Ms. Pearson chose to write a book about this world, I would buy it without a doubt. "Leaving" by Ally Condie - Admittedly, I was kind of confused about Sora's powers and what it meant to be Outside and Untouchable and whatnot, but I think that's also because this world is ripe with potential for further development. I simply want to know more and don't think that one story can cover this idea fully...... Anyways, there are three main reasons why I love this story. 1. It's so easy to empathize with Sora's emotions--I was tempted to quote a particular section at the end but thought it'd reveal too much. 2. As I sort of alluded to, the originality of the world. 3. I love Ally Condie's writing. I haven't run into anything quite like it, and it is incredibly beautiful as always. "Skin Contact" by Kimberly Derting - The story starts off immediately, and it's incredibly easy to slip into Rafe's fears regarding his dream. 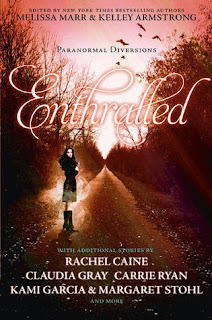 This one was one of my favorites because it was a good thriller with just the right amount of back story and because Rafe's emotions were so palpable that I was on tenterhooks, waiting to see what would happen. Best of all, I haven't read Desires of the Dead just yet (it's sitting on my desk), and I could still enjoy this story; in fact, I kind of have my own predictions about Rafe's personality and want to go read DoD now to see if they're true. "Giovanni's Farewell" by Claudia Gray - It was incredibly appropriate to start off Enthralled with Ms. Gray's story. Some of the stories are rather dark and some are light, but this was in between. I loved the brother/sister relationship dynamics and the cute little romance going on with Giovanni. Also, the world she creates is very open as in anybody could have a power (or at least it feels that way) although it focuses on only one family... so it is a great set-up for the rest of the anthology. *Disclaimer: I have not read Kelley Armstrong's series, the Morganville Vampires series, Jessica Verday's series, the Shade series, the Soul Screamers series, or Carrie Ryan's series (in full, that is) so I cannot tell you how these stories compared to the books. 1. The Variety of Creatures/Powers & Tones/Writing Styles - 1 angel story, 3 vampire stories, 2 ghost stories, 1 faery story, 2 combination of creatures stories, and the rest of the 16 do not have the typical creatures. I already mentioned how much I loved the gargoyles and Ally Condie's time-traveling? (I guess that may be the best description)... and I also love that there was a story on jinn!! I have to read As You Wish now; I have been looking for stories that have Middle Eastern aspects to them. ANYWAYS - besides the varieties in story topics, the stories themselves have different tones that make the anthology easier to read as a whole. Loved the humor in the stories penned by Sarah Rees Brennan & Jessica Verday, loved the alternating perspectives in Jackson Pearce's story & Melissa Marr's story, which also was arguably the most character-driven of them all, etc. etc. One thing is for certain - this anthology is full of twists and turns, and I don't think you're likely to get bored with it because of the variety. As you might have seen in my summaries, there is even a story written in verse. 2. 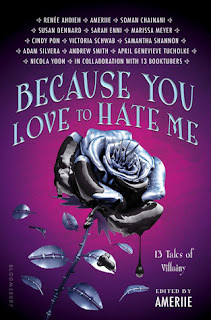 The Romance - One trend I haven't really liked in YA paranormal romance lately is the insta-love... And here, not one story featured insta-love. Instead, the anthology featured mild attraction between the characters and relationships that had been going on for a while. It was so incredibly refreshing.... And not all the stories even featured a main romance. For instance, in "Niederwald," Nash doesn't appear once though he is undoubtedly Sabine's romantic interest. 3. The Authors - Basically, all the authors did a great job. Also, I really liked getting to see the distinction between Margaret Stohl's writing and Kami Garcia's since all I've read is their co-written work. Even though some authors expanded on the worlds that they had already created in their books, I was still able to follow along without having read those series. Granted, some of the stories would have meant so much more had I read the series devoted to that paranormal world, but for some, it really wasn't necessary, and that in itself is a job very well done. Even if I only listed four favorites, that by no means indicates that the rest aren't good. In fact, they're great, and there wasn't a single story that I didn't enjoy. This anthology was a great "intro" of sorts to paranormal. For all those people who have been driven away by paranormal stories, well, welcome back, because this anthology isn't one you should fear. Check it now. I know I'm going to buy a fully edited copy :). If I wasn't clear about something, feel free to ask me about it. It must have been hard to review an collection fo anthologies!!! Wow not only did you have to provide a blurb for every one of them but you also had to actually REVIEW the book! I like the sound of Skin Contact, I'm not a big fan of books that start oh-so-slowly ( "oh! the win blew"...."she looked into the sky and admired the view"..."she washed her hands") so this one sounds right up my alley. Variety is good too, I could scream if I read anymore vampires novels ( although I tend to like them) and as a self pro-claimed romance junkie, it's good to hear that romance is a common trend! If Kit is who I think he is (been a while since I finished the books), like OH MY GOD! I love all the stories in this book! I love when authors write all these stories then put them in one book. I loved Gargouille the most!